The keys are a role and power given to the Church by Christ for binding and loosing sin—not only egregious and familiar sins, but also the subtle and secret, known only to God. It is written: “But who can discern his errors?” (Psa 19:12). St. Paul himself complains that with the flesh he serves “the law of sin” (Rom 7:25). It is not in our power, but in God’s alone, to judge which, how great, and how many are our sins. It is written: “Enter not into judgment with thy servant; for no man living is righteous before thee” (Psa 143:2). And Paul says, “I am not aware of anything against myself, but I am not thereby acquitted” (1 Cor 4:4). 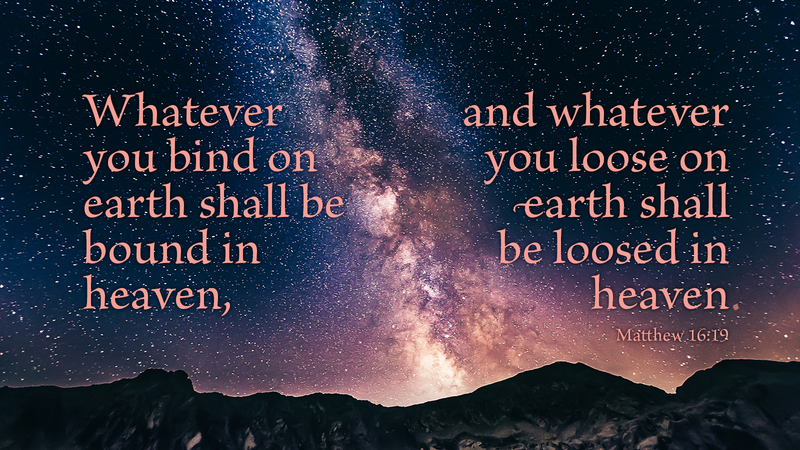 How is this binding and loosing of sins accomplished? Does it occur because one has finally confessed the last sin? If so, how does one confess an unknown sin, a stray thought, a wayward and quickly forgotten glance or word, an unknown, undone deed? Our sins are endless; give me a minute and I will produce two more. But with a word received with faith, it is all forgiven. Every sin—known and unknown, confessed in detail or part and parcel of the whole body of sin—is forgiven in Christ’s name. By his authority, the Church forgives the sins of all who call upon the name of the Lord. This loosing of sins does not happen because we have a clear conscience, but by God’s mercy through Christ. In a few words, we know we are sinners but we know with even more certainty that we have a Savior. Prayer: Search me, O God, and know my heart, and lead me in your ancient, everlasting way. Amen. This is Most Certainly True! 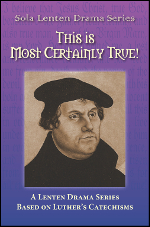 is a six-chapter mid-week, Lenten series that features dramatic monologues from Martin Luther, explaining what each part of the catechism means—ending it with the affirmation" "This is most certainly true!" In addition to the monologues, there is a sample worship service outline, hymns suggestions for each monologue, and opening dialogues for worship based on the parts of the Small Catechism.